Top: Giovanni Domenico Cassini, La meridiana del tempio di S. Petronio tirata, M.DC.XCV. 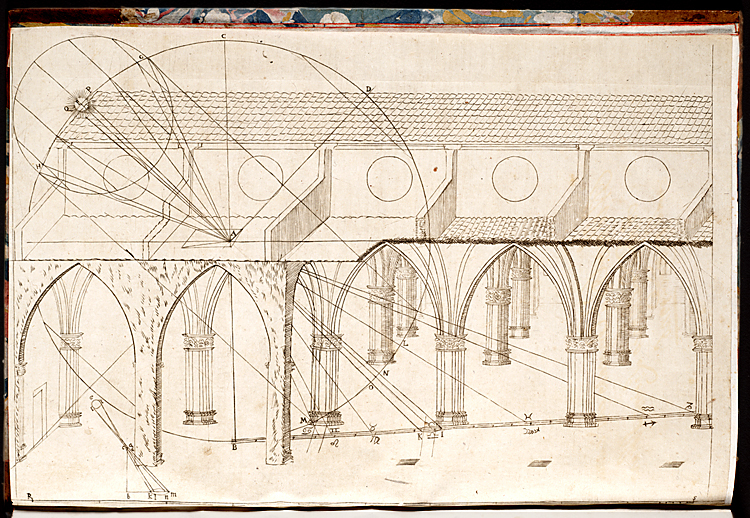 Plan of the cathedral of San Petronio in Bologna showing the solar meridian on the floor. Bottom: Piazza Maggiore, Bologna, Emilia-Romagna, Italy. South side of square, featuring from left to right: Palazzo dei Banchi, San Petronio Basilica, Palazzo dei Notai, Palazzo d'Accursio (now the Town Hall). Courtesy Tango7174, Wikimedia Commons. If you are lucky enough to travel to Italy, and especially, Bologna, you will undoubtedly be served cured meats in an antipasto, among them mortadella, which is a far cry from Oscar Mayer, but is definitely the source material (as is, I'm afraid, olive loaf, a bane of my childhood). Mortadella is a large Italian sausage or cold cut made of finely hashed/ground heat-cured pork sausage which incorporates at least 15% small cubes of pork fat (principally the hard fat from the neck of the pig). It is delicately flavored with spices, including whole or ground black pepper, myrtle berries, nutmeg, coriander and pistachios, jalapeños and/or olives. Traditionally the pork filling was ground to a paste using a large mortar (mortaio) and pestle. Two Roman funerary stele in the archaeological museum of Bologna show such mortars. Alternatively, according to Cortelazzo and Zolli Dizionario Etimologico della Lingua Italiana 1979-88, mortadella gets its name from a Roman sausage flavored with myrtle in place of pepper. Previous Post Good Luck, Amy! Just to clarify, the pistachio-filled mortadellas are traditionally from Tuscany while Bologna’s, well, bologna, is pistachio-less, as the local producer Alcisa indicates on their site (http://www.alcisa.com/mortadella_gb.html). The US tends to favor more the pistachio-filled mortadella, although a reason has yet to be found. Is there some historical trend of Tuscans that have led to such a migration? Thank you for the excellent article! And if you ask me why I’ll say. . .
‘Cuz Oscar Mayer has a way. . .